Bishop Kibira thanking Leader of Opposition in Parliament Winfred Kiiza and other MPs for their contribution to the activities of the diocese. PML Daily Photo. KASESE. 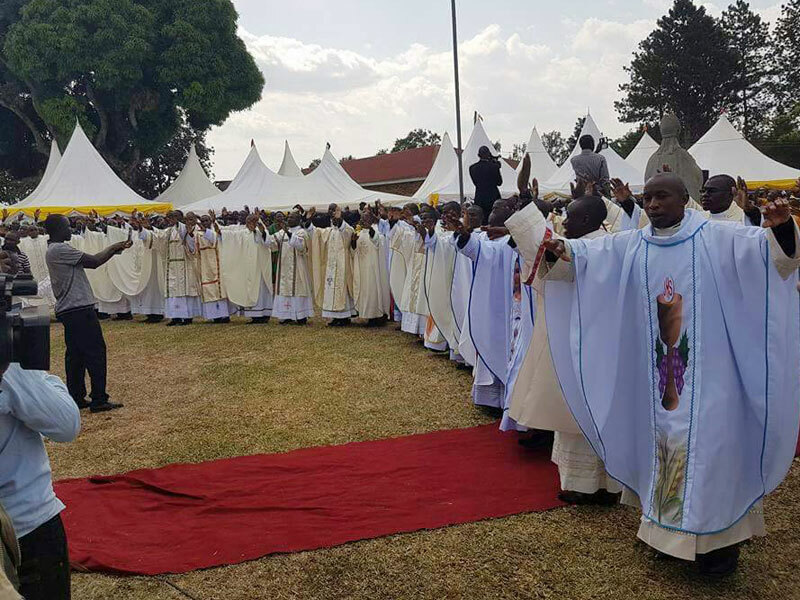 The ordinations season of the Catholic Church started on Saturday with Kasese and Mbarara dioceses ordaining 13 priests and several deacons. 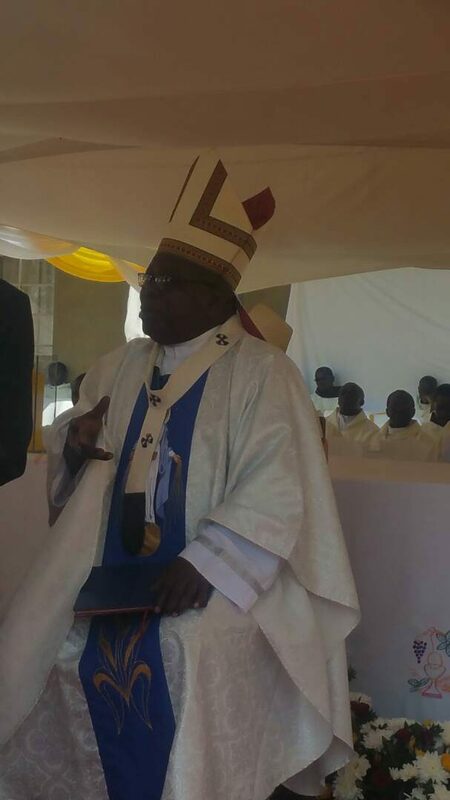 In Kasese Bishop Francis Aquirinus Kibira ordained Arthur Joseph Ssembaja Bwambale and Godfrey Sunday as priests during a colourful ceremony at Our Lady of Assumption Cathedral. At the ceremonies attended by several dignitaries including Leader of Opposition in Parliament Winfred Kiiza, Bishop Kibira called on leaders to support education for all, especially the girl child, which will get all the societies out of poverty. Members of AMDA follow the Ordination proceedings at Nyamitanga in Mbarara. PML Daily Photo. “My message today is about education. Let us take children to school. Without dedication, we are not heading anywhere,” he said. 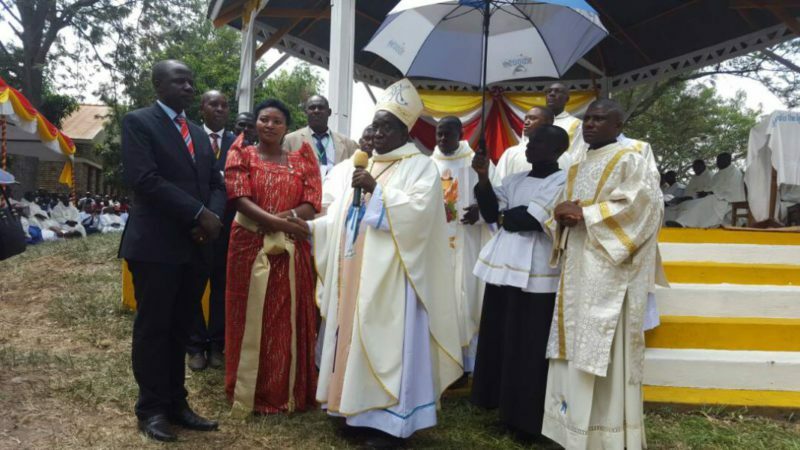 In Mbarara, Archbishop Bakyenga ordained 11 priests on a day of a beautiful harvest for the archdiocese. 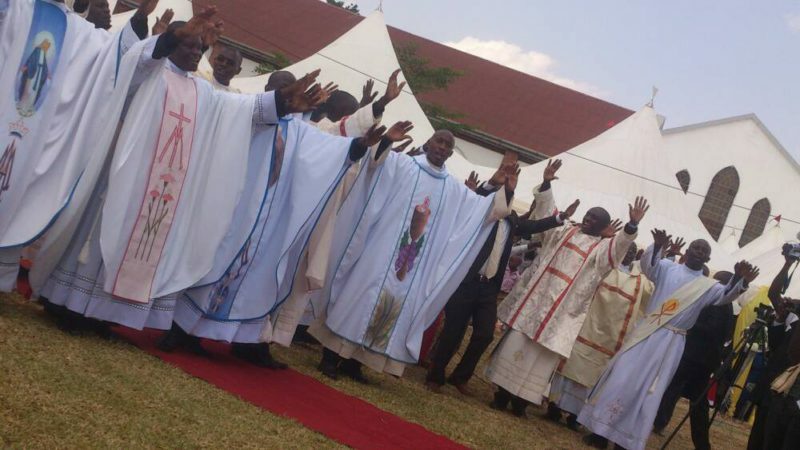 Newly-ordained priests wave to the audience that graced the Ordination at Nyamitanga, Mbarara. PML Daily Photo. 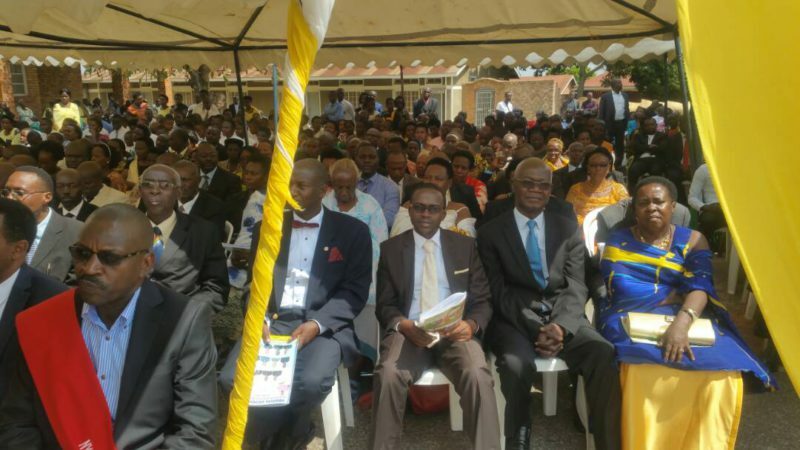 Those ordained included JB Atuhairwe from Kitura, Augustus Muhereza (Butare), Anthony Tumwebaze (Kakoma), Nobert Tukwatanise (Montfort, from Kakoma), Everest Tushabirane (Kashoero), Achileo Kihembo Rwiza (Kitabi). Others are Simon Muyambi (Rubindi), Adolf Mukasa (Buhungiro), Leonard Musinguzi, (Montfort), Emmanuel Musinguzi (Kashekuro) and Ludovico Ahimbisibwe from Nyakishojwa. Archbishop Bakyenga posted the newly ordained priests to the different parishes in the Archdiocese. Below are more pictures of the activities. Archbishop Bakyenga, prepared to ordain 11 priests on Saturday. PML Daily Photo. 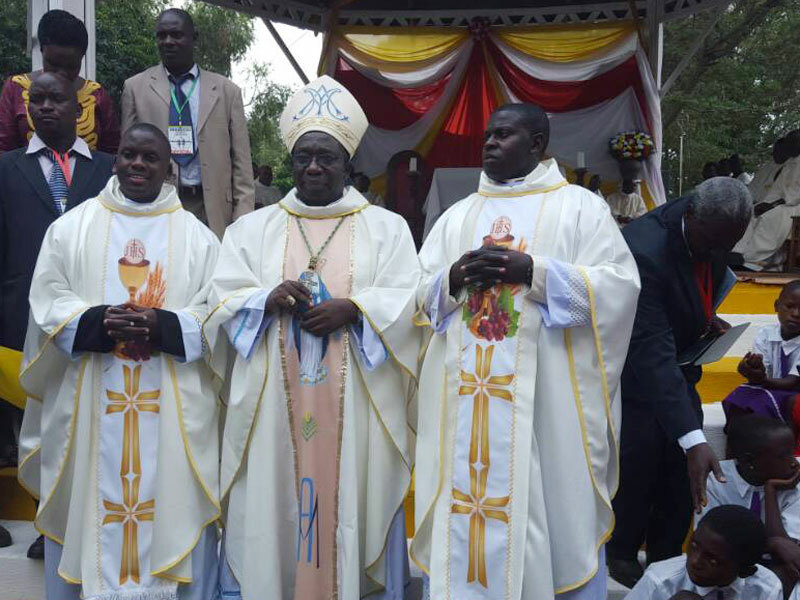 Newly ordained Fr Arthur Joseph Ssembaja Bwambale (L) and Fr Godfrey Sunday, pose for a picture with Bishop Kirabo. PML Daily Photo. 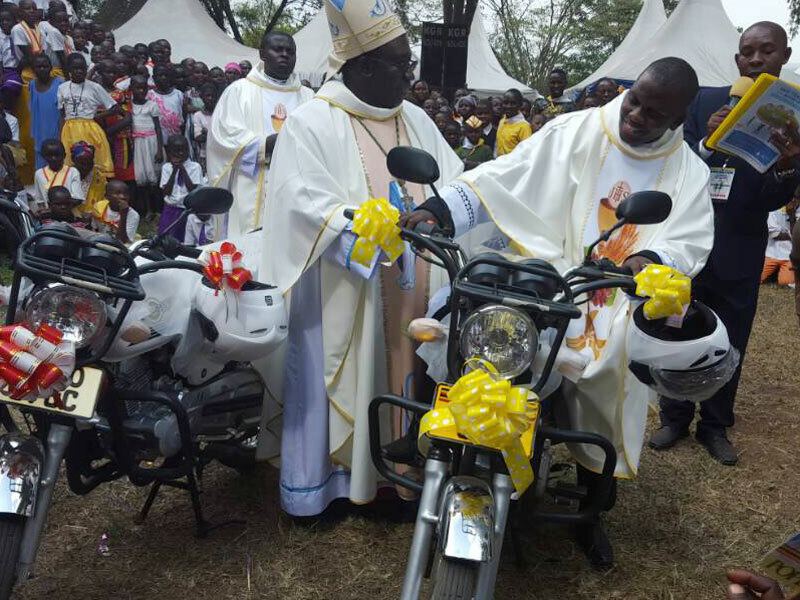 Newly ordained Fr Arthur Joseph Ssembaja Bwambale and Fr Godfrey Sunday were given motorcycles to ease theier movement (Fr. Arthur sitting on a motorcycle). PML Daily Photo. Newly-ordained priests at lead the thanksgiving dancing at Nyamitanga, Mbarara. PML Daily Photo. 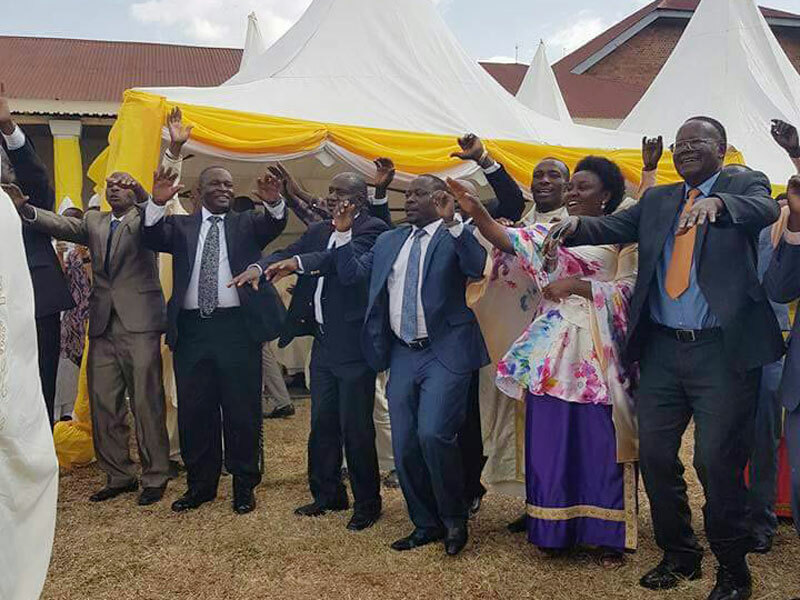 Tourism minister Ephraim Kamuntu (R) joins Buhweju MPs Koyekyenga and Francis Mwijukye to dance a thanksgiving song at Nyamitanga, Mbarara during the ordination mass. PML Daily Photo.